There were quite a few surprises Saturday night at the Junos Gala Dinner in Ottawa and they all seemed to revolve around people beating out Drake. That list included the Strumbellas, Jazz Cartier and the late Leonard Cohen. There were quite a few surprises Saturday night at the Junos gala dinner in Ottawa and they all seemed to revolve around people beating out Drake. The late Leonard Cohen beat him for artist of the year. Toronto's Jazz Cartier beat him for rap recording of the year. But no one was more surprised than the Strumbellas, whose song Spirits topped Drake's mega-hit One Dance for single of the year. Lead singer Simon Ward was so surprised, he ended up accepting the award shoeless. He said he was so sure the band wasn't going to win, he took off his pair of hard-to-tie-up boots at the table. "What we heard is if you beat Drake, you become Drake," chimed in the band's Dave Ritter. That's the kind of night it was — a much more laid back affair compared to Sunday's big, tightly-managed ceremony that's broadcast on TV. 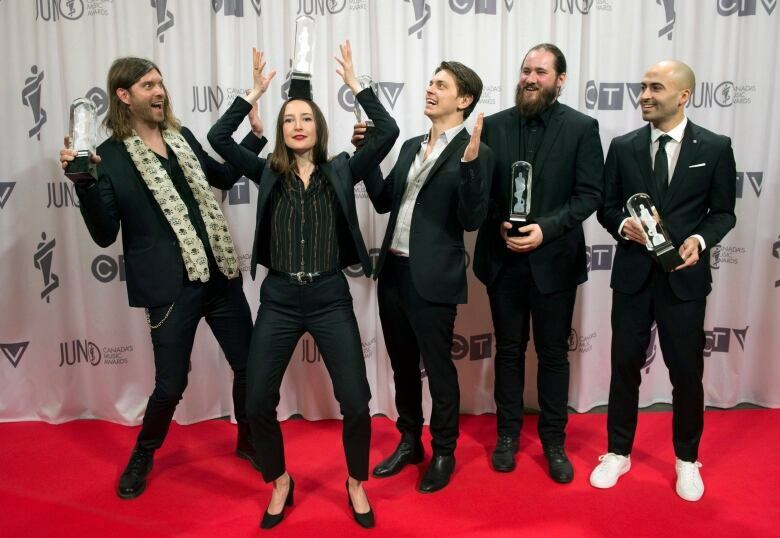 And the bulk of the Juno trophies were handed out too, with awards going to a healthy mix of veteran Canadian musicians and relative newcomers. One of those was Montreal's Kevin Celestin, better known as Kaytranada, who took home electronic album of the year for 99.9%. When he got snubbed for the nominations in 2016, the 24-year-old came out against the Junos, calling the Canadian music scene "out of touch" and tweeting he had lost his respect for the awards (that tweet is now deleted). He took it back post-win, thanking the Junos for recognizing him. "I regret saying all those things. It was definitely something I felt at the time," he told reporters backstage. 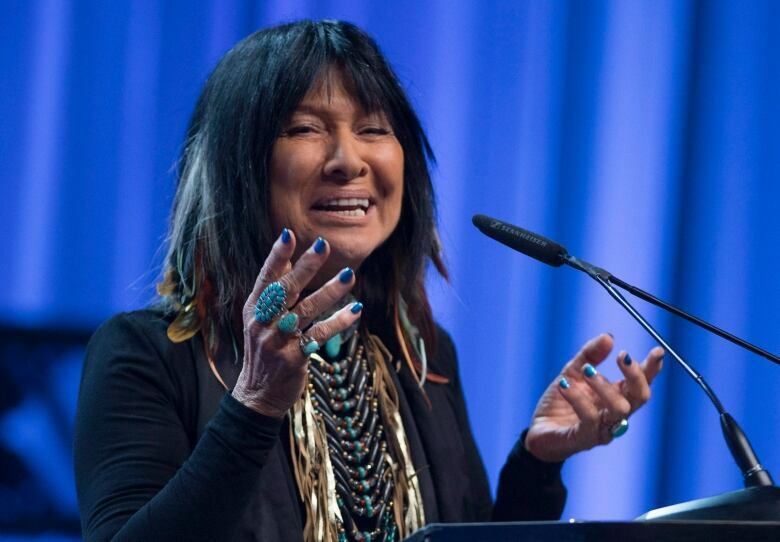 Buffy Sainte-Marie, the Saskatchewan-born Cree singer-songwriter, made a passionate plea for up-and-coming talent while accepting the Allan Waters Humanitarian award, one of the evening's legacy awards. "Please have the courage to go beyond your own role models and your heroes and whoever had the hit last month," she said. "Bring us your own uniqueness, your own special style and points of view ... don't be afraid. We're designed to create." Rock album of the year: The Tragically Hip, Man Machine Poem. Producer of the year: A Tribe Called Red. Adult alternative album of the year: Gord Downie, Secret Path. 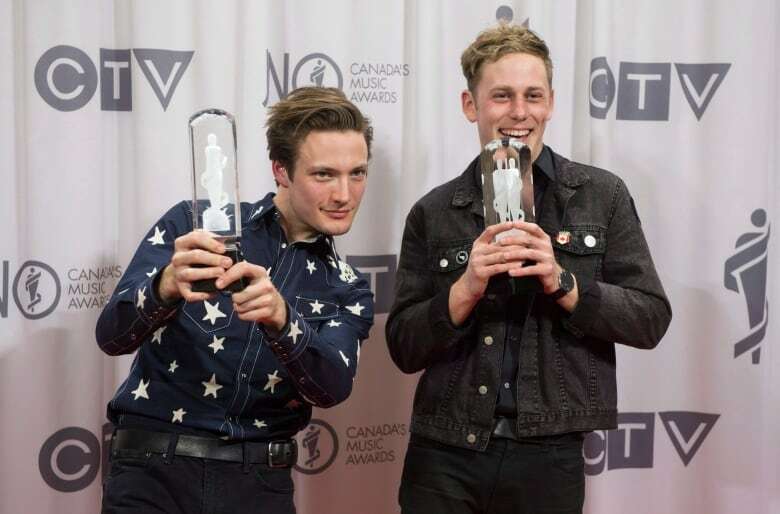 Breakthrough group of the year: The Dirty Nil. Alternative album of the year: July Talk, Touch. Adult contemporary album of the year: Sarah McLachlan, Wonderland. R&B/soul recording of the year: The Weeknd, Starboy. Indigenous music album of the year: Quantum Tangle, Tiny Hands. Drake wasn't entirely forgotten. He did win the international achievement award, which was not pre-announced or even in the list of awards handed out to reporters before the show. Among the night's most memorable moments was Adam Cohen's tribute to his his father, Leonard, while accepting his posthumous trophy for artist of the year. He said it was hard to speak on behalf of "someone who spoke so beautifully" but managed to find some humour in his death. "Many international artists find excuses to not participate in the Junos," the younger Cohen told the crowd. "I think he's found the best one yet." The legendary singer-songwriter died last November. Backstage, his son detailed all the work his dad was doing in his final days. He said his dad was smoking quite a bit of medicinal marijuana and had predicted Donald Trump would become U.S. president (he died a day before Trump would win the election). "Often times, he was working in his bathrobe or in his underwear." 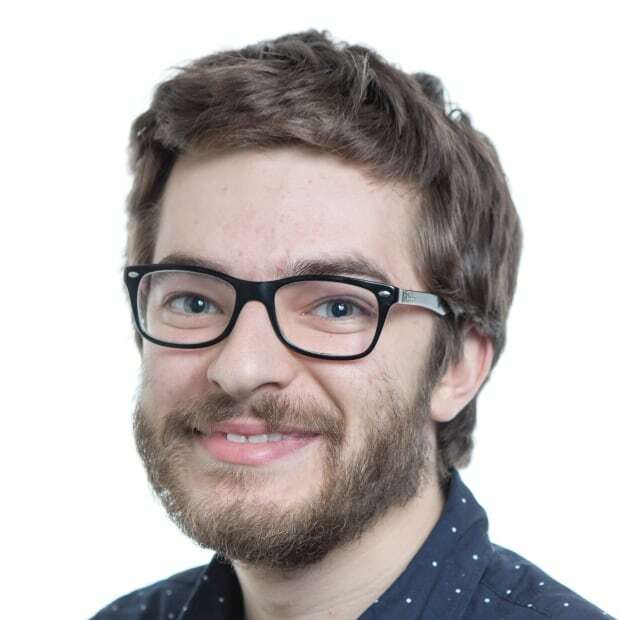 Cohen will be feted in a musical tribute by Feist during Sunday's ceremony at the Canadian Tire Centre, which also includes performances by Alessia Cara, Shawn Mendes, the Strumbellas, Ruth B, A Tribe Called Red and July Talk. The ceremony, hosted by comedian Russell Peters and singer Bryan Adams, starts at 6:30 pm ET.